The Rebels booked a final place at the finish in Walsh Park. 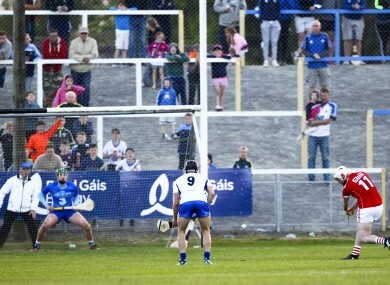 Declan Dalton fires a late penalty to the net for Cork. A GOAL DEEP in injury-time from a penalty by Declan Dalton handed Cork a dramatic victory over Waterford in the Bord Gáis Energy Munster U21 hurling semi-final tonight. Cork were reduced to 14 men in injury-time when Darragh Fitzgibbon, who sparkled throughout at midfield, was shown a red card for a pull across goalkeeper Billy Nolan. That looked to signal their exit at the first hurdle as Waterford were in control of a game where Patrick Curran, Colm Roche and Shane Bennett had all impressed for the home side in Walsh Park. But Cork mounted one last attack in injury-time and after working the ball downfield, substitute Jack O’Connor was fouled as he rushed towards goal. Dalton, who finished with 1-12 and displayed superb markmanship all night, held his nerve from the resultant penalty to smash the ball to the net. Referee Fergal Horgan sounded the final whistle soon after and Cork celebrated another notable victory after the county’s senior and minor teams claimed Munster crowns last Sunday in Thurles. Defeat was rough justice on Waterford. They had trailed 0-10 to 0-8 at the interval but chipped away at Cork’s advantage in the second half despite conceding a 37th minute goal when Robbie O’Flynn neatly finished to the net for Cork after being played in by Tim O’Mahony. But the game seemed to turn in Waterford’s favour when Shane Bennett finished cleverly from close range for a goal in the 51st minute. Dalton tied the teams at 1-15 apiece soon after yet then Waterford reeled off three points without reply and looked to be on the cusp of victory. Cork hung in there. They had to start without senior attacker Luke Meade through injury while another key forward Shane Kingston was well held by the Waterford rearguard and substituted in the second half. However Dalton was brilliant throughout and weighed in with 0-7 in the opening period when Cork were backed by the wind. Fitzgibbon was also superb in the second half while Dalton constantly supplied scores from placed balls. It appeared as if Curran would be the scoring star on the other side until that late penalty award and Dalton made sure it would be Cork who face Limerick in the decider on 26 July. Scorers for Cork: Declan Dalton 1-12 (0-8f, 0-2 sideline), Robbie O’Flynn 1-0, Darragh Fitzgibbon 0-3, Michael O’Halloran, Paul Leopold 0-1 each. Scorers for Waterford: Patrick Curran 0-10 (0-7f, 0-1 ’65) Colm Roche 0-5, Shane Bennett 1-1, Cormac Curran 0-2, Jack Prendergast 0-1. Email “Late Dalton goal hands 14-man Cork dramatic win over Waterford in Munster U21 semi-final”. Feedback on “Late Dalton goal hands 14-man Cork dramatic win over Waterford in Munster U21 semi-final”.